In 1909, Wilhelm Ostwald (1853-1932) — who came from the Baltic — received the Nobel prize for chemistry for his work on catalysis, an area on the fringe of physics, which promised applications in industry. Ostwald, who had been instrumental in the foundation of the first Zeitschrift für Physicalische Chemie, was also something of a pioneer outside his own immediate field: in addition to the history of his special subject, he showed great interest in the physical sciences as a whole, as is evident in Ostwalds Klassiker der exakten Naturwissenschaften. 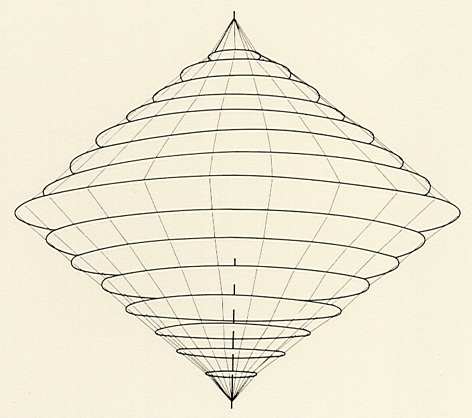 Although not always successful, Ostwald explored many new approaches to scientific thought, at one time attempting to refute the existence of atoms which, he maintained, were an uncalled — for hypothesis since their structure was invisible. 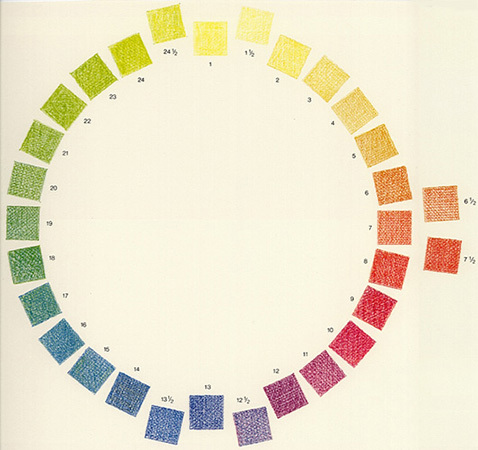 His final passion, however, was the theory of colours, and after his retirement (at the age of only 53), he devoted himself to the laws of colour in the hope of developing a scientific basis for their perceived harmonies. 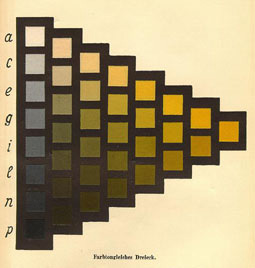 His Farbfibel «The colour primer» (historical illustr. 1 — illustr. 2 — illustr. 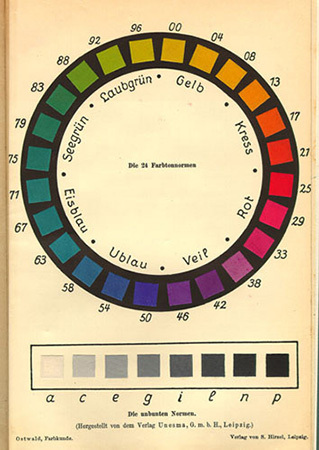 3), which appeared in 1916, introduced a colour system devoted to this task (and survived for 15 editions). We can thus formulate the guiding principle behind Ostwald’s theory of colour in the following way: the most universal mixture is the mixture of full colours, white and black. Each pigmented colour can be characterised by specifying the colour-content (at a certain colour-hue), white-content and black-content. In his Farbfibel, Ostwald proceeds systematically, drawing a distinction between chromatic and achromatic colours. He arranges his achromatic colours in the form of a grey scale along a line containing eight gradations, which conform to a geometrical sequence. In other words, the influence of visually dominant white does not decrease uniformly from above downwards, but does so geometrically, with the perceived mid-point between black and white being characterised by a proportion of approximately 20% white. (To avoid confusion, we have omitted the letters used here by Ostwald to identify these gradations.) The basis of the sequence is the so-called Weber-Fechner Law of Psychophysiology, although its application is technically limited. In fact, Ostwald abandoned his grey sequence which used this law as a basis. The full colours are arranged around a complete circle which leans towards Hering’s system and starts out with four basic colours: yellow to the north; red to the east; blue (to be more exact, ultramarine) to the south; and sea-green to the west. Four further colours are then placed between these: orange between yellow and red; violet between red and ultramarine blue; turquoise between ultramarine blue and sea-green; and leaf-green between sea-green and yellow. (Ostwald names orange «kress» and violet «veil». At the time of World War I, it was considered prudent to avoid all words borrowed from the French. However, we shall not be doing so.) 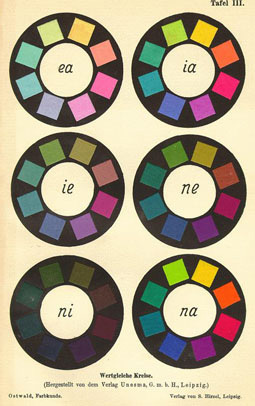 As with Munsell, the colours are arranged so that compensating colours (i.e. colour-pairs whose mixtures produce a neutral grey) are placed opposite each other: yellow-ultramarine blue, orange-turquoise, red-sea-green, and violet-leaf green. 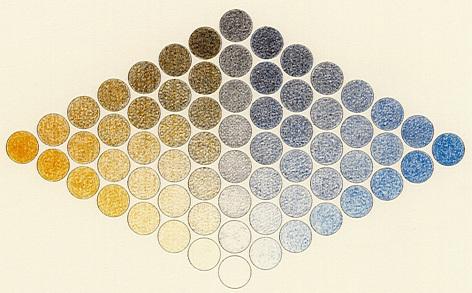 With these eight colours, Ostwald constructs 24 colour-hues with equal spacing and numbers them from yellow upwards, arranging them into a circle. 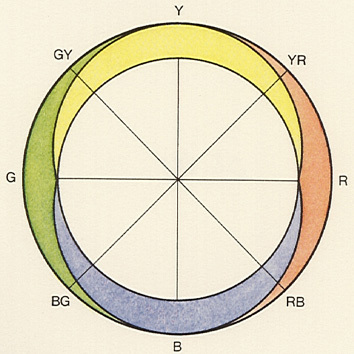 From the full colours of this circle, Ostwald then constructs the so-called «bright-clear», or «dark-clear» colours, resulting in a series which, towards either white or black, is «perceptually equidistant» from each respective colour. With that, Ostwald can proceed with the fulfilment of his original task: namely, to specify the general mixing of the other colours characterised by him as «dull colours» (or, in accordance with Hering, «veiled colours») and forming most of the colours existing in the colour-solid. Each such dull colour can be defined from a mixture of a full colour and a grey tone, with the grey tone being defined from a mixture of black and white. The colour standard desired of any particular full colour can therefore be realised using an equilateral triangle, with its central black-white axis — the grey scale — lying opposite the full colour as the third point. The sides of the triangle running from the full colour towards either black or white each contain «dark-clear» or «bright-clear» colour sequences. When joined onto the triangle of opposing complementary colours, such a monochromatic triangle — regarded as «psychological» by Ostwald — becomes a rhombus (below right) which can be applied to the entire circle of pure colours. The basis of a double-cone is created in this way, uniting all the colours of Ostwald’s system (above right). The Colour Harmony Manual, the third edition of which was published in 1948, provides a very good practical embodiment of this construction. The word «harmony» in the title aptly symbolises what Ostwald wanted to achieve with colours. Experience had shown him (and others) that some colour combinations could be seen as pleasant (or harmonious), while others were unpleasant. The question was why, and whether a law could be formulated. With his analysis of colour-harmony, Ostwald proceeds on the basis of his conviction that harmony is created by colour-order. To identify these harmonies, he even drafted a law (harmony = order), claiming that he could find all harmonies by analysing all the orders of colour which his colour solid — the double-cone — would allow, and that he could do this according to the rules of geometry. From 1926 onwards, these harmonies were summarised — initially by Ostwald himself — first of all in a Harmothek and later in the Colour Harmony Manual, with which we are already familiar. It would not be fitting for us to criticise Ostwald’s theory of colour, but it does appear that its effect is not very convincing. We probably have to accept that science does not provide us with information about the harmonious combination of colours in the same way as with sounds. Light and sound are different wave forms, and the eye, in contrast to the ear, possesses only rudimentary capabilities with regard to comparative analysis. In addition, we can barely see more than an octave (the maximum extent of the visible spectrum). There also appears to be no physical or physiological basis to the assumption that some individual combinations of colour are more desirable than others. Nobody — including Ostwald — has ever thought of improving on the magnificence of a rainbow by removing or adding a component of its colours. However, Ostwald did wish to improve Japanese woodcuts and recommended a new colouring using his standards as a basis, henceforth regarding this to be more «Japanese» than the originals. In the world of art, Ostwald may indeed have created rather a doubtful reputation for himself with this claim. But his system nevertheless left its mark: for example, the Dutch «De Stijl» movement with Piet Mondrian at its centre focused on his work — at any rate, Mondrian’s treatment of colours in 1917 and 1918 had much in common with Ostwald’s theories. Date: Wilhelm Ostwald, the Nobel-prize winner for chemistry, compiled his Die Farbenfibel (The Colour Primer) in 1916/17 in the hope of developing a better understanding of their perceived harmonies. Related systems: Bezold — Wundt — Hering — Pope — CIE — Luther & Nyberg — Müller I — DIN — Müller II — N.C.S. Bibliography: W. Ostwald, «Die Farbenfibel», Leipzig 1916; W. Ostwald, «Der Farbatlas», Leipzig 1917; F. Birren, «The Principles of Color», New York 1969; H. Hönl, «Die Ostwaldsche Systematik der Pigmentfarben in ihrem Verhältnis zur Young-Helmholtzschen Dreikomponenten-Theorie», Naturwissenschaften 21, pp. 487-494 and Naturwissenschaften 22, pp. 520-524 (1954); John Gage, «Colour and Culture, Practice and Meaning from Antiquity to Abstraction», Thames and Hudson, 1993, pp. 247-250 and 257-260.